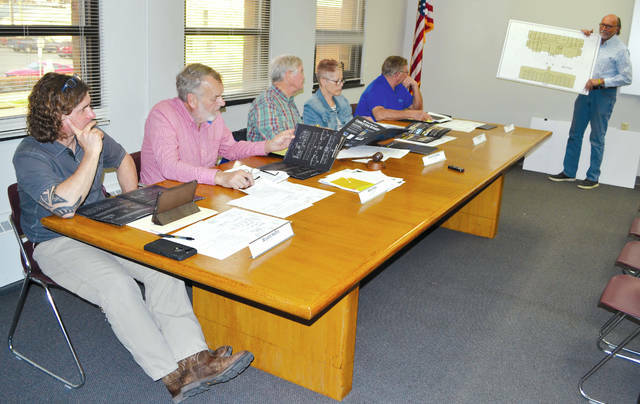 Urbana Hotel investment group co-chair Mike Major (far right) holds up plans for the new hotel as he requests a variance from the Board of Zoning Appeals (from left to right): Bryant Heflin, Marty Hess, Chairman Vince Gonzalez, Lisa Haulman and Charlie Zerkle. The Urbana Board of Zoning Appeals unanimously approved a variance request for Urbana Hotel, LLC to allow the planned hotel at 170 state Route 55 to be 2.5 feet taller than allowed by code at a meeting on Monday. According to Champaign Economic Partnership Director Marcia Bailey, the land upon which the new hotel will be built has been cleared of trees and construction is expected to begin within the next few weeks. Investment committee co-chair Terry Howell said Cobblestone Hotels has a brand and prefers to keep the style of their hotels consistent. The peak of the roof for the proposed hotel is 2.5 feet taller than the zoning standard, not including the cupola, which was exempted from the regulations. The 54-room hotel will be three stories with about 10,500 square feet per floor on three acres. It will include a variety of room layouts, such as extended-stay, large family, and studio. Bailey said that this hotel will be attractive to customers because it will be the only hotel in Urbana with a pool as well as a workout room, conference center and breakfast bar. The three acres will provide enough parking area to provide for bus traffic from tourism and visiting sports teams, she said. The city council rezoned this parcel from R-3 High Density Residential to B-2 General Business District last November, and sale of the land formerly owned by Kay Slesinger at 170 state Route 55 was finalized on Feb. 21 for $225,000. There is a planned partnership with Urbana University to create a program training people in the hotel business. Investment group co-chair Mike Major said he had been impressed by the support for this project from every level of the community. Also at this BZA meeting, the board rejected two applications submitted by Champaign County Habitat for Humanity for variances at their 142 S. Russell St. property. BZA board member Lisa Haulman was the sole vote for approval in each 4-1 vote requiring the property to have a driveway that is durable and dustless, and to construct sidewalks in accordance with the zoning code. Neighboring property owner Don Richardson handed out a letter on behalf of another neighbor, Keith Norris, who stated concrete sidewalks and driveways are required and Habitat should comply with the same code requirements as everyone else. Richardson said that the dust coming from an unpaved driveway, potentially gravel or dirt, would affect other residents in the neighborhood. He said he didn’t want to establish a precedent for future residents. BZA board member Marty Hess, who is also the president of the city council, said that he was in favor of all properties having sidewalks. This property will be used as Habitat’s 11th build this year, and construction has begun. – the BZA unanimously approved three applications allowing homeowners to build sheds within 4 feet of the property lines at 1539 Grimes Circle, 560 East Lawn Ave. and 1549 Grimes Circle. Board president Vince Gonzalez noted that there are many nonconforming sheds in the Grimes Circle neighborhood that were grandfathered under current zoning restrictions. – the BZA unanimously approved a request from Nikki Weiss to build a deck/pool four feet from the side and rear property line at 965 East Lawn Ave.
– the BZA unanimously approved a variance request from Roger and Monica Kramer to allow a fence to be built zero feet from the right-of-way line on their property at 442 S. Main St., with the condition that the contractor work with the engineering department to address a line of sight issue within 45 days and have the work complete within 90 days. Board member Bryant Heflin recused himself from this vote as he is the project contractor. – the BZA approved a flier that will be sent with the May utility bills, and again in early January, informing residents of which department they would need to contact to get permits for various types of improvement projects on their property.